Performers include: David Janssen, Barry Morse, and William Conrad (narrator). Dr. Richard Kimble (David Janssen), a pediatrician in Stafford, Indiana, is wrongly convicted of murdering his wife Helen (Diane Brewster) and sentenced to the death penalty. Prior to Helen’s death, it was no secret in their small town that the Kimbles were having marital trouble. On the night of the crime, they argued loudly and were overheard by their neighbors. To calm down after the fight with Helen, Kimble left his house and went for a drive. Upon his return, he saw a one-armed man leaving and found his wife had been murdered. But no one had seen Kimble go on his drive and he’s subsequently arrested and convicted of the deed. En route to death row, Kimble’s train derails and crashes, allowing him to escape. Now more determined than ever to solve the case on his own, he travels from town to town while tracking the killer. He’s also evading Lt. Philip Gerard (Barry Morse), who is as obsessed in finding Kimble as Kimble is of finding one-armed man, Fred Johnson (Bill Raisch). Kimble changes his appearance, takes on aliases, and works low-paying, anonymous jobs in order to continue traveling and dodging the police. This drama follows Kimble in his pursuit for the truth and proves there’s no rest for the wicked… or the innocent. The one-armed man, Fred Johnson, is arrested after tearing up a Los Angeles strip bar. When Kimble reads about it in a newspaper while working in Arizona, he travels to Los Angeles. He runs into an old friend, a woman named Jean Carlisle (Diane Baker), who is working as a typist with the Los Angeles Police Department and who has seen Gerard searching for Kimble. Jean reveals that she has been fond of Kimble since she was a child, when her father’s arrest and disgrace left her family with no friends, except the Kimbles. After Kimble learns that Johnson has been arrested, he elects to turn himself in. Johnson is bailed out of jail by a corrupt bail bondsman who formulates a plan to blackmail the person who supplied the bail. Johnson kills him after learning that the money came from someone in Stafford. While taking the train from Los Angeles to Stafford, Kimble tells Gerard that he found something that might lead him to the truth, and that he believes Johnson is going to Stafford too. Gerard decides to give Kimble 24 hours to prove his innocence. If he can’t Kimble will turn himself in and finally begin serving his sentence. Kimble knows that the bail bond slip was signed by a man using the name Leonard Taft — the name of his sister Donna’s husband (Richard Anderson). The man turns out to the Tafts’ neighbor, Stafford city planner Lloyd Chandler (J.D. Cannon). When Chandler meets Johnson at an abandoned riding academy, Johnson blackmails him for $50,000. Chandler tries to get the money while hiding it from his wife Betsy, even resorting to putting his house up for sale. Eventually, he cracks and tells her what he has done and reveals that he had witnessed the murder of Helen Kimble. Helen had called Chandler over to the house in a frightful panic after her husband had driven off. While upstairs, both and Chandler heard Johnson breaking into the house to rob it. Helen confronted Johnson, who responded by attacking her and beating her to death with a lamp. Meanwhile, paralyzed with fear, Chandler sat on the stairs watching through the bar. Chandler never told anybody about it because he was afraid that his standing in the community would be ruined; he had fought in World War II and earned a Silver Star while in combat. He feared that if anyone found out about his moment of cowardice in the Kimble home he would never live it down. Kimble is unsuccessful in finding his evidence within the 24 hours he was given, and so is about to leave with Gerard to head to prison. Just before they leave, Donna alerts the two that she has found a bullet in one of her sons’ dresser drawers. Gerard identifies the bullet as being identical to the one they found at the riding academy when they went to investigate the day before. Donna tells her brother and Gerard that the bullet must have come from Chandler as he took the boys to a shooting range the day before. Kimble and Gerard head over to the Chandler residence to learn that Chandler has headed to an abandoned amusement park and is luring Johnson there so he can make up for his earlier cowardice by killing Johnson. By the time Kimble and Gerard arrive at the amusement park, Chandler and Johnson have started a firefight with Johnson’s pistol squaring off against Chandler’s rifle. While racing towards the shooting, Gerard takes a bullet to his thigh from Johnson, temporarily disabling him. The lieutenant gives Kimble his weapon and he heads off to finally confront his wife’s murderer. Chandler helps the lieutenant walk and Gerard tries to convince him to finally speak up about what he saw. Kimble tries to stop Johnson but the one-armed man shoots at him. He then has Kimble dead to rights but is out of bullets and flees to the top of a carnival tower. Kimble and Johnson fight and the good doctor saves Johnson from falling. The felon repays Kimble by attacking him further and Kimble beats Johnson bloody as he finally confesses to Helen’s murder. Kimble can’t believe that he’s finally heard the confession and Johnson seizes the moment to grab the fallen gun. He’s sick of Kimble pursuing him, doesn’t regret killing Helen and is ready to shoot Kimble too. Having observed from below, Gerard uses Chandler’s rifle to shoot Johnson and the one-armed man falls to his death. Kimble climbs down and tells Gerard that he was able to get a confession, but now that Johnson is dead he cannot prove his innocence. After remaining silent for too long, Chandler says that he will finally testify on Kimble’s behalf and exonerate him. In the final moments, Kimble leaves the courthouse with Jean, Donna, Leonard, and a mob of reporters. He’s asked what he’ll do now and he replies that he guesses that he’ll see his family and then go back to work. On the lawn, he sees Gerard and he extends his hand to Kimble. The two shake and Gerard watches Kimble and Jean leave. What do you think? Do you like The Fugitive TV series? Was the last episode fulfilling? where can I find the last episode of the fugitive? The Fugitive struck me as a Western: man alone vs. all kinds of opposing forces. I ADORED this show. It is in my top 5 all-time. 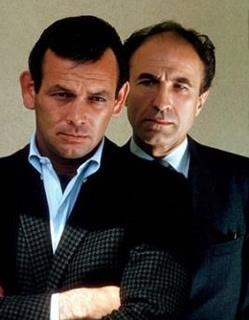 I’m just sorry David Janssen got burned out. I think it could have gone on indefinitely, although I’m glad it got to produce a definite ending. Yes, the entire 4 years of The Fugitive was very fulfilling and enjoyable. I just happened to stumble on this show in the mid 1980’s and after watching “Girl from Little Egypt, I was hooked! Truly one of the best TV shows I have ever seen and much better that what TV has to offer these days. It never gets old and Yes, I know every episode word for word, but I wear that badge proudly. Please bring back ” THE FUGITIVE”. I miss it so much !! where and what was the name of abandon amusement park the final episode of the fugitive t.v. show was filmed. thx. rick p.
Pacific Ocean Park in Santa Monica, California. It was built to compete with Disneyland in 1959, but fires and financial problems led to its closure in fall of 1967. I agree !!! I don’t know why they took it off ME TV ???? Please, ME TV, bring ” THE FUGITIVE” back to ME TV !! thank you. I rediscovered the Fugitive after many years. I didn’t watch it when I was a kid, probably didn’t understand it. Now that I’m much older, I can appreciate the beautiful plots and subplots. This is the most exciting dvd series I own. By the way, the remakes are ok, but just not the same drama. Janssen makes Dr. Kimble. Harrison Ford is a good actor, but he doesn’t have the dimension that Janssen did. I too now enjoy watching the program, but missed the last espiosde . I wonder if it comes on channel 2me if i could be told ahead of time. I really wanted to watch it no, dvr, vcr at the time. I too felt the same way about the movie (never saw the remade series). That being said, if the series was being remade, I would want Jim Cavezial ( Person of Interest ) to do Kimble’s role. He looks, and acts just as Janssen did. My favorite show of all time.